When it comes to payment, we offer convenient and practical methods to our clients. We undertake both online and offline payment methods which are hassle free and safe for the clients. Quality raw materials have been used for the production of our entire range. As a dependable name, we procure these raw materials only from trustworthy sources present in the market. Our experts design Camouflage Fabrics to suit the colors and landscapes (which will help the forces to hide). 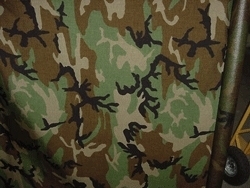 We provide these fabrics for various purposes like, uniforms, general use tents, rugsacks. Pay Mode Terms: Advance, Cash, T/T (Bank Transfer), Western Union.